is that what is in the box? preheat the oven to 375 degrees. 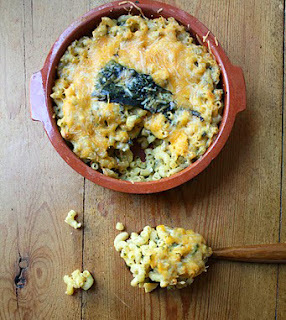 grease a large baking dish or cast iron skillet, and pour the drained pasta into the dish. in a pot (you can use the pot the pasta cooked in or you can do this while the pasta boils), on low heat melt the butter. add the garlic and cook for 1 minute. whisk in the flour and cook until a light brown, toasty paste is formed, about 1 minute. whisk in the milk and stir until it's thickened a bit but still fluid, about 1 to 2 minutes. remove the pot from the heat and stir in the mustard powder, cayenne, cumin, lime zest, cilantro and chopped poblano chiles. adjust seasonings and add salt and black pepper. slowly add half of the cheddar cheese and stir until it's melted and well combined into the sauce. (if the sauce has cooled too much and the cheese won't melt, return the pot to low heat on the stove. if, however, the sauce gets too thick, like a custard, you can then thin it by stirring in milk, a teaspoon at a time.) pour sauce over pasta and top with the remaining half of the cheddar cheese and bake uncovered for 20 minutes or until brown and bubbling. sprinkle with cojita cheese, and serve immediately.